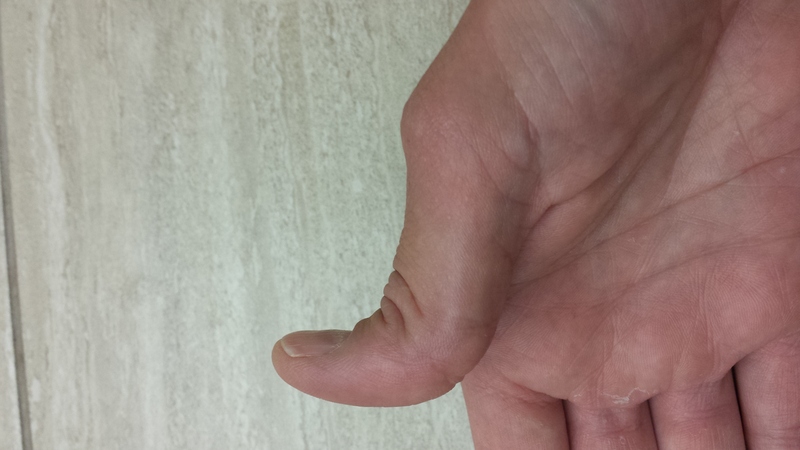 For many years now I have worn a MCP splint on both of my thumbs. I wear these splints everyday as they prevent further damage to my thumbs and, most importantly, controls the discomfort and pain that my thumbs cause me. With its simple design, the splint stops the hyperextension of my MCP joint. 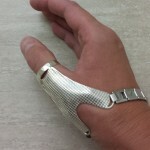 For many people the worse part of the splint is the bracelet which is necessary to anchor the splint in place. Over the years I have trialed three options for this bracelet and all three have pros and cons. This bracelet is made of stainless steel and is the one I started with and is the one that is on my splints today. It is not overly pretty but it is functional and effective. It is quick and easy to get on and off. 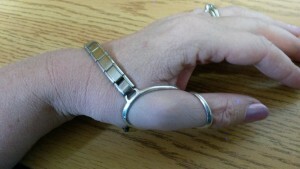 It holds the splint tightly in place while still allowing movement as it expands as I move. It is the best option for me as I am very active with my hands, working in the garden, kayaking, cooking. It sits tight against the skin which can become uncomfortable at times and can pinch delicate skin. This bracelet is much more dainty, and well, pretty. 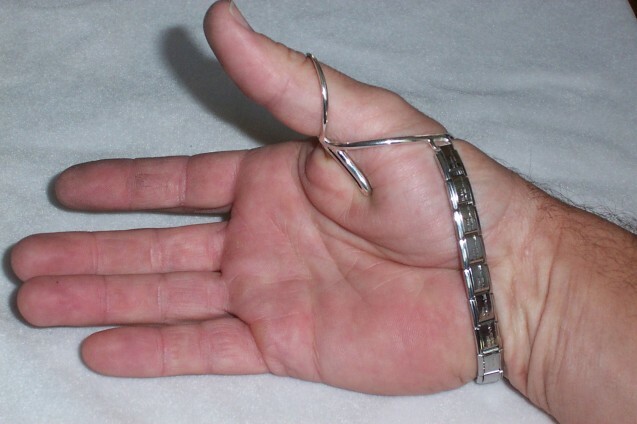 It does not sit tight against the skin as it dangles around the wrist. It is not as effective as the splint has more movement. 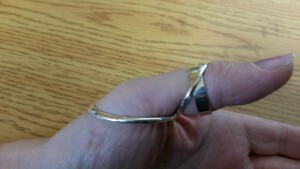 I found that I needed to push the splint back into place when I was actively using my hands. I also found it very difficult to get on and off and often would need to have someone help me. I was more likely to not put the splint on in the morning as it was difficult to do so. 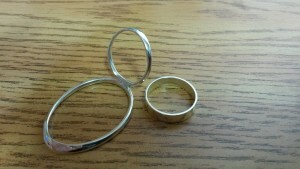 This option is not a bracelet at all but a separate 5mm sterling silver ring. 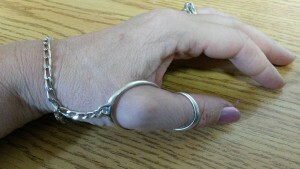 The splint was anchored firmly in place and allowed me to use my hands as I needed. It was wonderful not to have anything around my wrist and it felt less obvious when I wore it public. It was very comfortable most of the time. My hands have a tendency to swell, both from hot humid weather and from being active and working hard. I wore this option on a camping trip earlier this year and with all the biking, hiking, and kayaking I did my hands swelled, the anchor ring became too tight and I could not wear it. Every person is different and what is best for me may not be best for you. 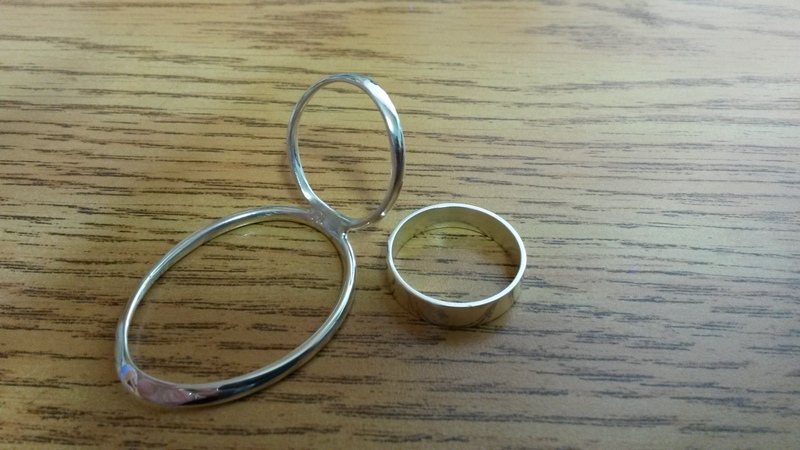 I will suggest trying the Traditional Bracelet first and if that is not working then look at the Anchor Ring and then finally the Sterling Silver Bracelet. If you would like to discuss these options please feel free to contact us. Meet Kristina, or at least her thumbs. Kristina came to visit us in the office this summer to get our new Dorsal Splint. 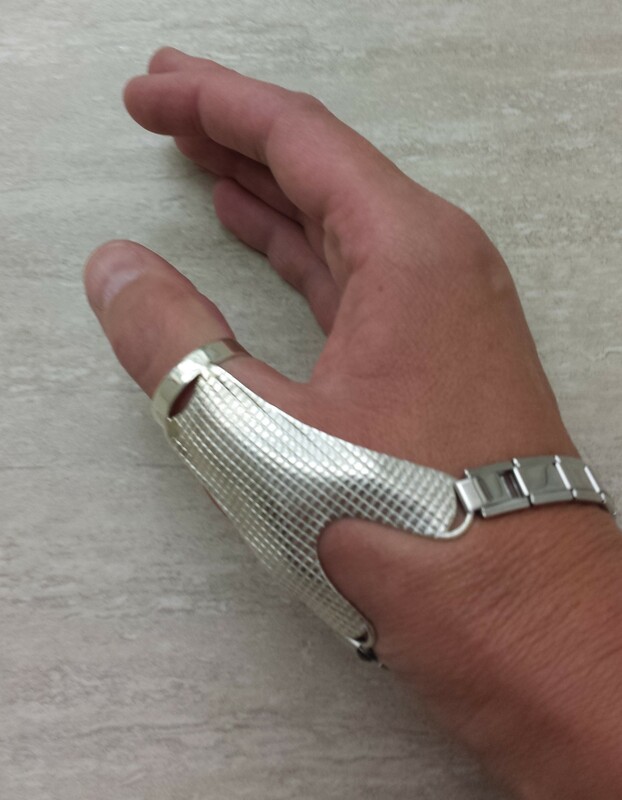 This splint will keep Kristina’s thumbs from collapsing and will allow her to do the everyday tasks she needs to do. Dolly’s CMC it pretty much fused but the MCP joint at her thumb has gone into hyper-extension to the point of subluxation. 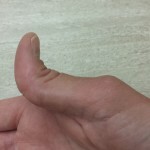 All this fancy talk to say that her thumb is very painful and if we could stabilize it, much of the pain of joint fatigue and tendon fatigue would go away. “Thanks Derek. I am so glad I went yesterday. I cannot believe the difference 12 hours makes. My splint is amazing. What a difference. I noticed today the usual pain I have in my hand, arm, shoulder & neck is nearly gone. I stopped taking my extra pain meds & so far I don’t need them. I enjoyed our chat. Thanks again. Have an awesome day & stay warm.